Ok, this is really a takeaway joint but it does have tables, so I couldn’t talk my way out of it – even if the tables are covered in carpet. 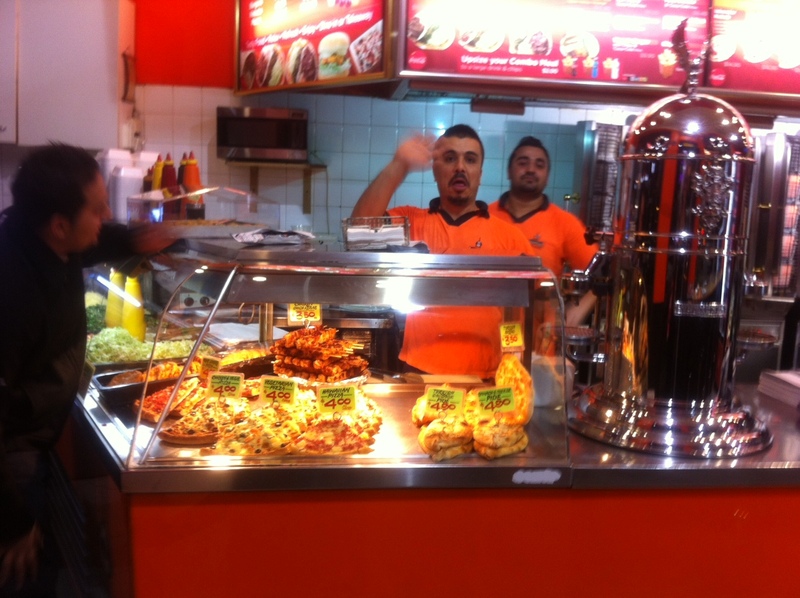 After the Kuleto’s FOOD fiasco we have come here in search of nourishment and there is plenty on offer: kebabs, pizza, burgers, pide, and of course, chips. No one is ever going to miss this place, it is lit up like a power station. The colour scheme and the staff uniforms feature the same fluorescent orange that features on hi-vis work gear. They are playing to their audience, Istanbul On King is essentially an eatery for the working man (and woman, but mostly the man – at least while we were there). Security staff, tradies, taxi drivers – this place is for them. Well, the front is. Out the back is a little bit more exotic and eclectic. It turns out to be particularly targeted at Strop. Along with carpets on the tables and walls (but strangely not on the floor), Strop has discovered intricately knitted gloves and socks stuck to the walls. I didn’t know the Turks were into knitwear, this place has paid for itself already. We order a mixed vegetarian plate for her and a lamb plate for him. Both plates are huge and the vegetarian option has lots of variety (cabbage roll, felafel, vine leaf roll, omelette, tabouli) for the same price as six smoked salmon and nori crackers at Kuleto’s. But the lamb wins, firstly because it is meat, and secondly because it is tasty, crunchy and generally yummier than the vego gear. I think Sherpa Kitchen is next but I could be wrong. 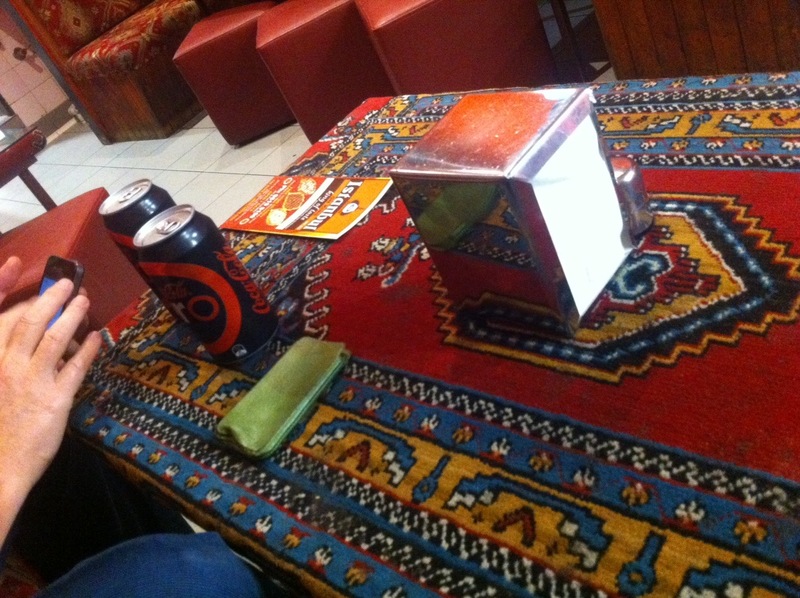 Disappointed not to see any mushy microwaved felafel squashed into that beautiful table carpet!